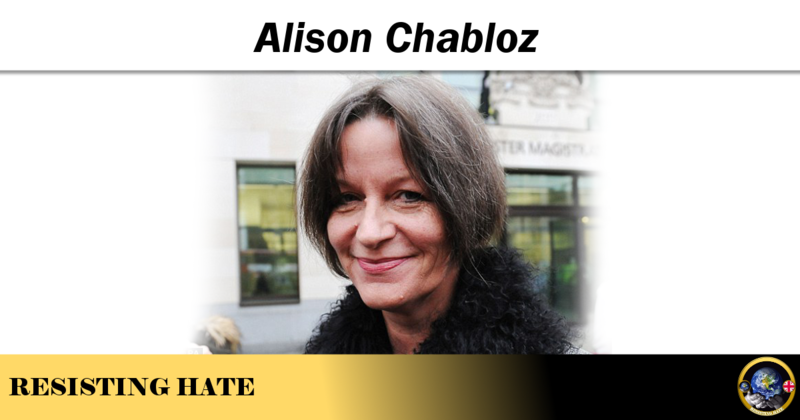 Resisting Hate first came across the notorious Anti Semite Alison Chabloz in 2015. Like many anti hate groups we have felt it prudent to keep an eye on a woman who seems so relentlessly determined to slander the memory of the millions of innocents slaughtered by the Nazis in the Second World War. For Ms Chabloz is a Holocaust denier. Not in the academic sense – which is a futile position anyway given the hard evidence that the Holocaust (including the gas chambers Ms Chabloz) took place – but she is a denier in the Jew hating, delighting in causing as much public offence and misery as possible sense. Ms Chabloz was currently suspended yet again after @ajctmusic and @alichabz and her previous accounts @alison_chabloz , @alisonchabloz, @GotABonetoPick and @elixr13 were suspended for hate crime. Chabloz hit the headlines (and our inbox) with a rather weak attempt at attention seeking during the Edinburgh fringe festival in August 2015. She is pictured here performing the “quenelle” which she (predictably) denies is an Anti Semitic gesture but which is agreed by pretty much everybody else (Including the French government who want it banned) as being a deliberate symbol of hatred against the Jewish people. We took a look at some of the accounts she follows on Twitter. Interesting friends for a woman who consistently tries to deny the fact she is Anti Semitic. Alongside her ever growing attempt to demonise Jews Ms Chabloz likes to cosy up to pro Islam accounts. (Would suggest you leave Mr Ansar alone Alison, your increasingly bunny boiling tweets in the form of serenading him are probably scaring the poor little man to death). The idea of taking sides though is actually a carefully orchestrated and hypocritical lie for Ms Chabloz. Because while she was doing her best to manipulate members of the Islamic community to support her vitriol against the Jews she was actually stabbing them in the back at the same time. 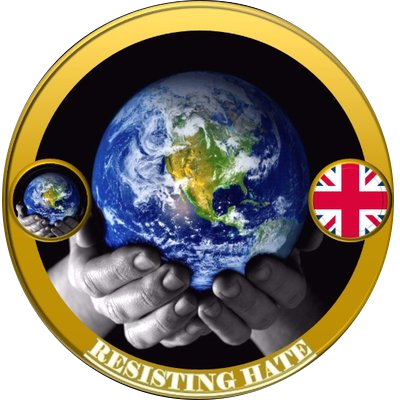 As our regular readers will know Resisting Hate follow the actions of Bluehand very closely and we were not at all surprised to find the (somewhat desperate for followers) leader of Bluehand @Bluehand007 welcoming Ms Chabloz as a new member. Bond’s other Old Bluehand members were equally glad to embrace the self styled “supporter of Muslims” into their intensely Islamophobic hate group. 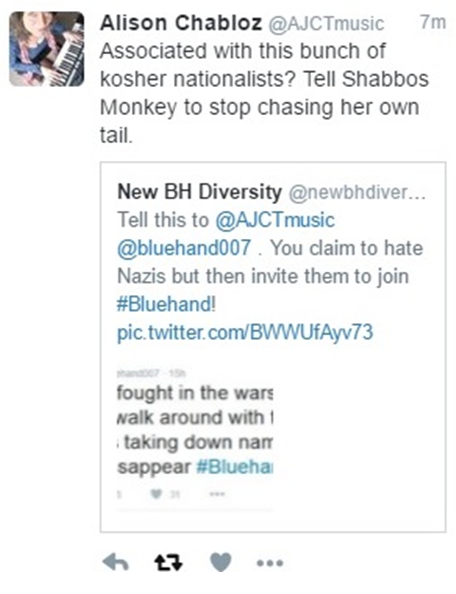 This inviting of Ms Chabloz to Bluehand provides yet another clear link between Bluehand and Anti Semitism. It also proves Ms Chabloz is not the freedom fighter she likes to pretend she is but is in fact a woman committed to the general principle of anti religious hate. She could not have publicly damaged herself more than by joining one of the most radically far right Islamophobic hate groups on the internet. This are the other accounts Ms Chabloz follows on her current Twitter account. Hidden among her anti Jewish tweets are several accounts with a similar hatred toward Islam. This further supports our belief that for Ms Chabloz her alleged support for Islam is no more than a front to hide her agenda of fuelling a discord in Muslim/Jew relations. We gave Alison the courtesy of letting her know we intended to write an article about her and her link with Bluehand and she replied with the tweet below. Judging by the arbitrary reference to a monkey it looks very much that in addition to her Anti Semitism and Islamophobia she is a racist as well. it looks very much like the answer is that Ms Chabloz is equally as antagonistic toward Muslims as she is toward Jews. She is willing to bed (metaphorically, please don’t panic Mr Ansar) with Muslims when she is attempting to use them as a means to an end to push her personal agenda of anti religious hatred but dig a bit deeper as we have and her true nature is soon revealed. On 25 May 2018 Alison Chabloz was convicted of posting grossly offensive material to You Tube. 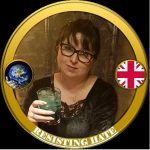 On 14 June Alison was sentenced to a 20 week prison sentence, suspended for 2 years, and a ban on social media for 12 months. Great article. Thank goodness there are intelligent people and organisations such as yourselves taking the time and effort to monitor such utterly abhorrent people as this vile woman. There really are no words to describe someone who has no qualms whatsoever insulting the memories of all those poor men, women and children who were murdered in the Shoah. Thanks for your comment. Yes, she is a very unpleasant individual, currently charged with hate crimes. Excellent article; thank you for exposing this nasty piece of work. 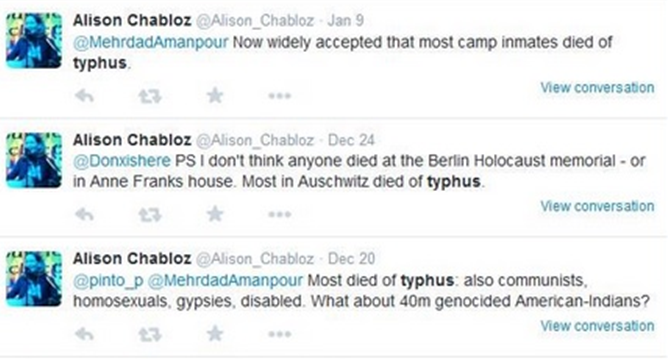 Alison Chabloz is clearly a disgusting anti-semite. She is not a British citizen, so why has she not been deported? Creeps like her don’t belong in the UK. WE thought it prudent to keep an eye?? So you are a self appointed Sheriff of the Internet? Or something far more sinister? The Jewish people have been around for over 5000 years, I think they can take a satirical song. Is Armenian holocaust denial illegal? Many Jews feel that the CAA prosecution risks making a martyr of Ms Chabloz. If people like Ms Chabloz lack the integrity to self censor then the law has to do it for them. Which law? The one for the rich or the one for the poor? There’s only one law in the country and it applies to all equally. She will receive the just sentence she deserves. Aside from her extreme hate and nastiness, the woman has a bleak life to show for all her “work”. She is jobless, rejected and abandoned by her family and former co-workers, and now a renowned and infamous hate criminal. What this woman has probably never understood is that her own overwhelming lack of self-esteem and hatred of self has decimated her. There are legitimate reasons for me to doubt the Bolshevik purges in Russia, also the genocide of 100 million Native Americans…..Where are the well-funded lobbies campaigning against me? Why is it only illegal to doubt the Jewish narrative on history? Why is it now you’re labeled a hate-monger for pointing out factual inconsistencies in the Jewish narrative of WW2? Remember Steven Speilberg’s documentary on the Holocaust? Remember the testimony footage he used in it of that man who spoke about the girl who threw him apples every day? That was a lie! Am I an Anti-Semite for pointing that fact out? How about the Black guy who told his story about liberating Buchenwald? His military records reveal that he was never there and he lied. Is pointing out that Speilberg used both these false ‘testimonies’ in his documentary an expression of hate speech? Where’s the space for debate and verification in all of this? Where’s the space for stating facts and having them answered honestly? Because in this day and age there seems to be none! The message we’re being forced to accept is, “This is the way it went!! Believe it or else! !” This isn’t how people with nothing to hide operate. What do you mean by a ‘Jewish narrative on history’? Of course there are people who claim to be survivors of the Holocaust who are fake. Does that make the rest of them liars? It seems that anecdotal evidence is valid only when it benefits the ‘so called revisionists’. There are also people who claimed to be survivors of the Grenfell Tower tragedy who were fake. Does this mean that the rest of them are liars or that it didn’t happen at all. Is there a ‘Grenfell Tower’ narrative as well? There were never 100 million natives in the Americas…not even close…when you open with such a blatant lie, I know the rest of your post is rubbish! As you have managed to misread the first paragraph, one assumes you didn’t understand the rest of the piece either. She is not ‘too fringe for the Fringe’ as she keeps repeating – she is actually too racist for the Fringe. 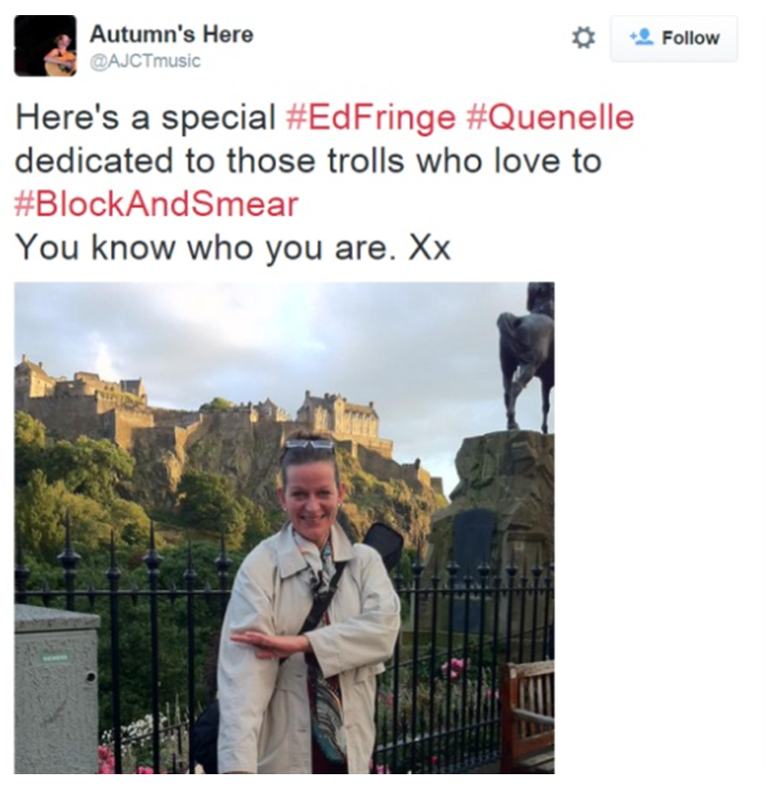 The Fringe was not designed as a platform for racists and anti-Semites. You should add Gilad Atzmon to your list! He’s a friend and supporter of Chabloz! Or is he not criticised because he is a supporter of the Labour Party and Compo Corbyn? Not come across him but always happy to look into any hater. Will investigate.